“Philosophy of Science in Anthropology” reads as though the scholars were gathered in a room after an exceedingly enjoyable dinner party. The discussion is lively, organic. There’s not the clearly defined introduction and conclusion of other reviews that I’ve read. It instead has the circular organization of a neatly wrapped short story. It begins and ends with commentary on methodology. With this review I feel the most driven to read more. I want to continue this conversation. I’m reminded of childhood learning… of the conversations with authors of books and characters in books that I took up (in my mind) to entertain myself. I could picture myself in that room of wood and leather and smoke, brightly colored fan in one hand and well-tailored wool under the other rested lightly on the arm Abraham Kaplan as we moved in and out of intertwining conversations… the joy of having a person tutor. Can anthropology be science? Should it try to be? Is science just a matter of employing the right methods? I was disappointed to learn that he was deceased. My local library has several of his books and I look forward to reading them. As I read “Groups That Don’t Want In: Gypsies and Other Artisan, Trader, and Entertainer Minorities” I became increasingly disheartened and disappointed. Sharon Bohn Gmelch gave ample warning of the limited nature of the subject matter covered in the review, but still I had hoped for more. Gmelch writes that gypsies were “relegated to the status of unintegrated social and economic marginals” and as such “ignored or regarded as barely legitimate subjects for serious study.” She indicates that there wasn’t an abundance of scholarly literature to be found and that from that already limited pool she would further limit the review “primarily to anthropological works published in English.” It’s not as though I haven’t been aware that I’m currently engaged in a very Westernized (particularly Americana) study of anthropology. It’s not as though I haven’t been aware that sometimes anthropological works only have the appearance of an emic-informed discussion. I just recently encountered a discussion of the possibility and effects of this type of bias and misrepresentation while reading “India: Caste, Kingship and Dominance Reconsidered.” Maybe it’s just hard to prep for what early “academic” study and literature is often like; it seems to take a long while to sift out bias, particularly in culture studies. Gmelch makes no pretenses that the literature discussed is necessarily fair, balanced or objective. The review seemed more an organized discussion of how artisans, traders and other entertainer minorities deviated from the “norm” as opposed to a discussion of the culture of those groups. I had hoped for the latter. The review was published in 1986; I’ll have a look around for more recent work on the subject. The review was published in 1986; I’ll have a look around for more recent work on the subject. Reading this review, I have reassessed my decision to push reading “Regional Studies” to a later date outside my current yearlong survey of anthropology. At least some of the reviews in the “Regional Studies” category in the Annual Review of Anthropology are written by locals. I’m gaining a clearer understanding that I need to incorporate these sooner rather than later. Academia, in similar fashion to the wider culture, seems so given to reproducing bias that it is imperative to counter-act this tendency as aggressively as possible. “Advances in Evolutionary Culture Theory” and Yeah, Why Not One Global Culture? Evolutionary culture theory is based on the premise that, however else [cultures] may be related, all cultural systems are related by descent. In other words, a long and unbroken chain of cultural transmission connects each of the world’s extant cultural systems with a single common ancestor; however remote and obscure the ties may be,all cultures have “descended with modification” from this one original culture. Durham states that the main questions in ECT have to with why so many cultures, more than 4000, have branched from the one culture and with the pace and mechanism with with that change occurred. Durham labels these as questions of differentiation and transformation respectively. In writing about differentiation Durham asks why so many cultures instead of “simply one global human culture.” This question struck a nerve with me as I’ve often toyed with the idea of whether we’re moving in the direction of having one global culture. I then started to think of culture development in terms of the Big Bang. The story of how culture emerged way, way back when begins with the Big Bang. Culture is a social thing. And this has never been a cosmos of loners. From the git-go 13.7 billion years ago it’s been a social universe, a cosmos of tight, intimate bunches, of massive mobs, and of huge communities. The Big Bang was profoundly social. [Tattersall] argues that the use of symbols was an invention, the fruit of some insight, that led to an eruption of cultural behavior — the production of rock art, creation of decorative beads, etc. Although it would be a long time before speech would become written language, language is assumed to have been born when symbols were invented. More and more I think that will have to study linguistics whether I want to or not. Anyway, in thinking of culture and the Big Bang, I mostly thought of the idea of one global culture and how that may relate to scenarios that predict that the universe would expand for a while before collapsing back to its original state which lead me to think of human technological advancement as being driven, moved, directed by innate demands to coalesce back into one culture… roads, vehicles, telecommunication, boats, planes, the Internet, the types of ideas captured in art and literature all working toward forming this one global culture. This is a line of thinking to which I definitely wish to return. I believe that this model could be helpful to my understanding and I look forward to investigating and developing it more. I am having a problem with understanding. “Understanding” may not even be the right word. More and more as I recover cognitive functioning, I find that I can produce a correct answer to a question or provide a correct solution to a puzzle, without easily being able to explain how I arrived at the thing. 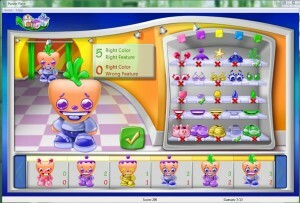 I’ve been playing this collection of children’s games that are included with Windows Vista, Purple Place. Yes, I play them all, even the cake-making game. One of the games, though, is of a type I especially enjoyed as a kid and still do as an adult. 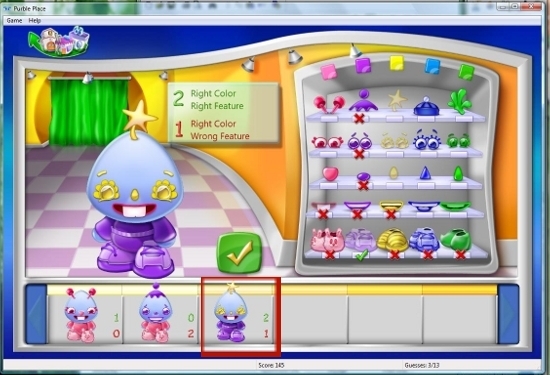 In this game (Purple Shop) there are five features (hat, eyes, nose, mouth and clothes) and five colors (red, purple, yellow, blue, green). 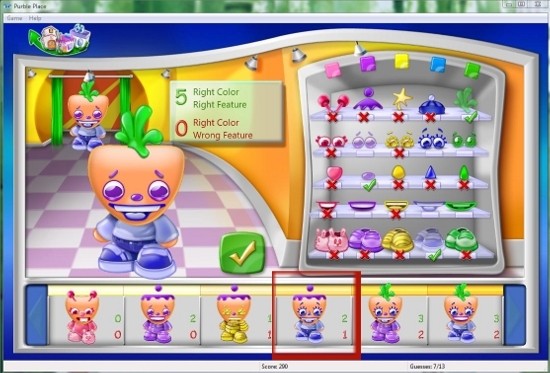 Each turn of the game, the player chooses a color for each feature and gets back totals for “right color-right feature” results and “right color-wrong feature” results. So, if the eyes are blue, but the player chooses blue for the nose instead, then blue would be a “right color” but on the “wrong feature” resulting in one (1) “right color-wrong feature” result. Say that in the course of guesses and results, it becomes clear to me that the nose has to be blue. It comes to me and there’s a certainty of belief. I know that the nose has to be blue. Then I stop to explain how I’ve come to that conclusion and there’s confusion where there used to be clarity. Why is my conscious mind fighting me? I’ve played the game slower several times, and that seems to help with the confusion. I can work out the solution step by step, but it’s like chewing nails. Each of the panels represent a turn during which I have made selections and gotten the results off to the right in each panel. Looking at the fourth panel outlined in red, there is one “right color — wrong feature” result (the number “1” is in red indicating this result). The Steps: This result has to refer to the purple hat. From a previous panel, I know that at least two of the features are purple, so the purple is definitely a “right color”. If the color blue were on a wrong feature then there would be two “right color-wrong features” and not just one. The only way for the color blue to be a right color, but on a wrong feature would be for the hat to be blue since every other feature is blue already. So, if blue were wrong, the blue would be replacing the purple meaning that the purple would also have been on the wrong feature thus resulting in two(2) “right color–wrong feature” results. This time the focus is on red and yellow. Purple is there, too, but I know from a previous move that the purple is definitely a “right color–right feature” so it’s out of consideration. Looking at red and yellow, I’m presented with the same pattern as above. There is one red colored feature, all the rest are yellow, and there is one (1) “right color–wrong feature” result. So, I know that the mouth cannot be red and it cannot be yellow. Looking one panel over to the second panel, in which the clothes are red and everything else is purple, there is an example of the situation where the clothes have to be purple since there are two(2) “right color–wrong feature” results in contrast to the very first example with only on “right color–wrong feature” result. If purple is on the wrong feature, then the clothes are the only “right feature” left since everything else is already purple. As I’ve said, in the beginning it was a lot easier for me to slow down the game play and walk through my thinking for every step, but I found that process got harder and harder to do as I recognized more patterns. I wasn’t always recognizing these patterns on a conscious level. I just got the result. My brain seemed to like seeing things in patterns and resisted my conscious mind challenging the pattern recognition. I started to feel physically uncomfortable when I slowed down to ask why I arrived at a certain result. Panel 1 — I learn that none of the items are colored red. Panel 2 — I learn that two of the items are colored purple. Panel 3 — I learn that none of the items are colored yellow, because the results add up to two and I know that the “two” result has to do with purple since two of the items are purple. Panel 4 — I learn that the hat can’t be purple and it can’t be blue. All the four other colors are eliminated, so the hat has to be green. Even when I play the game quickly, I find that I may arrive at the conclusion that the hat has to be green without a conscious awareness of how I got there. Looking slowly over the panels, the answer is clear, but I believe that I sometimes recognize patterns over several moves without being aware of that on a conscious level. This is all well and fine for a game, but I wonder whether I and others do this for social “truths” as well. If I decide or further still, if I’m instructed at some point that females are less good at math than males, would my brain resist going through the steps to challenge that thought? Might I trust that there is a pattern that shows that males are better at math than females and therefore close off thinking that might show otherwise? And what then for more complicated social “truths”? Find instructions and links for downloading the Purple Place games here is you don’t have them already. I chose to read “Conversation Analysis” in part because I’ve gotten a little behind in my reading and I thought that I would have quick, easily produced comments given that I had bumped into the subject of conversation analysis while reading “Language and Dispute.” I came across an Introduction to Conversation Analysis by Charles Antaki while reading the latter article. The site has a brief description of the field as well as a tutorial with audio and video, sample transcriptions, instructions on making notations, and sample analyses. The site provides a gentle introduction to some of the same names and sources mentioned in the review article and seen on the Wikipedia page on conversation analysis. The site is fun and light and assumes no specific prior knowledge of the field. The review article wasn’t quite so fun and light, but that was to be expected. Reading “Conversation Analysis” I wasn’t particularly drawn toward the quick, easily produced commentary I had in mind (a glossy overview of a specific conversational interaction). [Conversation analysis] seeks to describe (my emphasis) the underlying social organization–conceived as an institutionalized substratum of interactional rules, procedures, and conventions–through which orderly and intelligible social interaction is made possible. An initial finding is that different kinds of responsive actions (e.g. agreements/ vs disagreements) are performed in markedly different ways. While agreements are usually performed promptly and in intensified form, disagreements are delayed and mitigated in a variety of ways. While Goodwin and Heritage did discuss some of the theoretical underpinnings and disciplinary exclusions that gave birth to the field of conversation analysis, they manage to keep that discussion within the limited context of giving background information. That discussion doesn’t take over and shape the whole review. I have a much easier time reading the Annual Review articles today than I did six weeks ago. I still don’t grasp as much on the first read-through as I would expect, but there has been significant improvement. For a while I thought the answer to my sluggish comprehension was to read slower, taking notes as I went. What I’ve found is that it’s best to have a smooth first read. As the review articles and other academic articles generally have good introduction and conclusion areas, I find that things I don’t at first appear to be grasping in the middle section often come together over the course of the article. The amount of increased understanding on the second read has been steadily growing. On the second read, I’m able to make more connections with earlier readings. In “Death: A Cross-Cultural Perspective” the writers state American funerals are so uniform because Americans value conformity and that syncs up with the discussion of conformity as an American culture trait as discussed in “Anthropologist View American Culture.” I notice that the authors state that the theory of punctuated equilibria has had an impact on thinking about brain development in “Hominid Paleoneurology” as well as on theories of culture development as discussed in “The Archaeology of Equality and Inequality,” and it adds to my sense of how theoretical concepts move across fields even when there’s not necessarily a perfect fit. When I saw clearly how parties to an academic dispute lavish praise on academics who tend to agree with them as encountered while investigating “Hominid Paleoneurology,” that changed how I view any praise given by one academic to another even when a dispute is not immediately apparent. The fact that I had read “Language and Disputing” prior to reading “Hominid Paleoneurology” enhanced my appreciation of the dispute tactics evident in that article. These are in-your-face examples, but I sense that I am making increasing numbers of subtle connections as well. I look forward to a time when my first read-through resembles my current second read and I continue to fight my feelings of frustration that this isn’t already the case. Since I am going through a period of cognitive recovery following a time of medicated brain fog, I knew this reading would be more difficult for me. The review articles are written by anthropologists for anthropologists so they are heavy with industry speak. I considered feasting on lighter reading for a while or reading in a field with which I have greater base fluency such as legal writing, but I think the challenge inherent in the choice I made to read from the Annual Review of Anthropology is actually resulting in bigger and faster gains in cognitive function. Engaging in self-study is a very stumbly process. I’m grabbing at the corners of tables and squishing my fingers into the edges of seat cushions. And I wish I didn’t know about falling down.